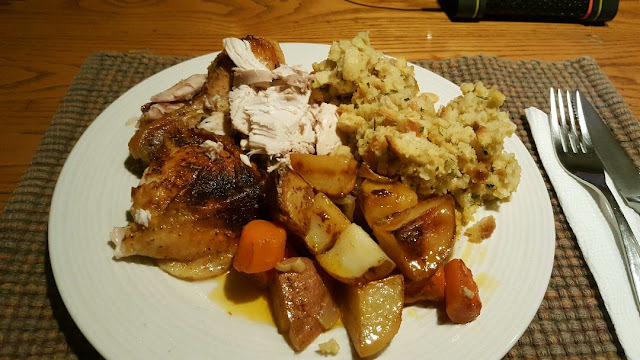 On Easter Sunday I made an Oven Roasted Chicken Dinner. This is usually my go-to holiday meal for Thanksgiving and Easter. We love it! It cooks for a total of 2 hours, this is after the first half hour. As long as you brine the chicken and baste it during cooking, it's so darn tender. 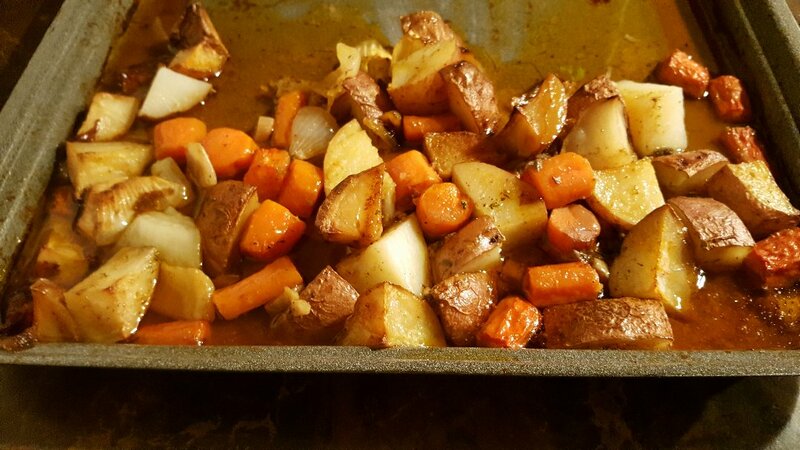 I put it on a bed of root veggies during cooking and the veggies turn out just as tender and flavourful! After two hours, the skin is nice and crisp and the veggies melt in your mouth. We had some leftovers for dinner last night. Our favourite rotisserie chicken restaurant is called St-Hubert, I think it's just in Quebec and maybe some parts of New Brunswick. They have the best chicken we've ever tasted. 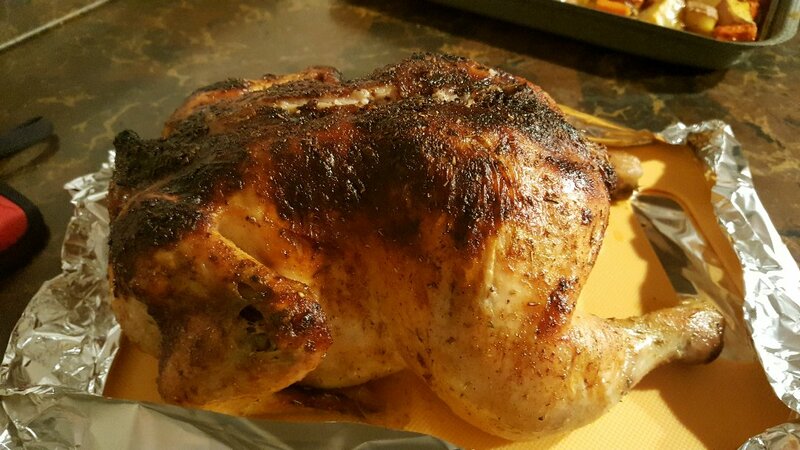 I've been trying to perfect the rub on this chicken for years now and I think I've got it! 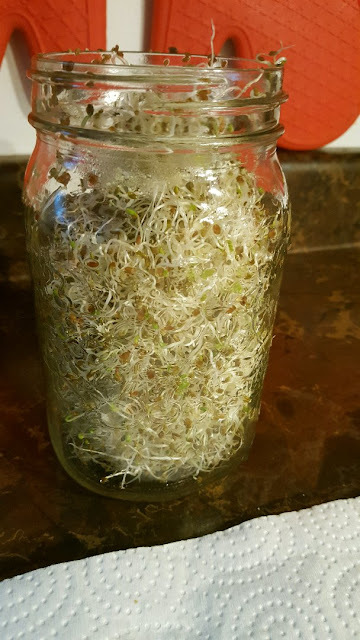 I'm very impressed by the amount of alfalfa sprouts that I got from 1 tbsp of seeds! They are so crunchy and delicious! I didn't get as much from the same amount of seed with the Spring Salad mix though. I tasted that one, and I think it will be an acquired taste for me, it's very...hmmm...sprouty? Very earthy...I don't know, I know I'll get used to it though! Today is my big shopping day and I'm just waiting another half hour to call the vet to renew Oscar the cat's allergy pills, then I'm off! "Your lemon will ripen some more off the branch but not as much as you would think. Know that that lemon is probably good to go and you will definitely enjoy the flavor. Completely sweeter and better than the store bought. In my opinion. So I think we'll be tasting it sooner than later! Sprout success! We all should have sprouts going especially in the winter time when gardens are bare. I hope to be set up come this fall for sprouting sunflower seeds in soil 'cause they're our absolute favorite. Your posts on sprouts have made me even more determined to sprout this coming winter. The best thing about cooking a chicken, or duck or goose or turkey, for just the two of us is the leftovers. Since we don't eat huge quantities of meat, I can get quite a few meals out of one bird! Hope your big shopping day goes as smoothly as possible. I know you'll have a car full when you return home! 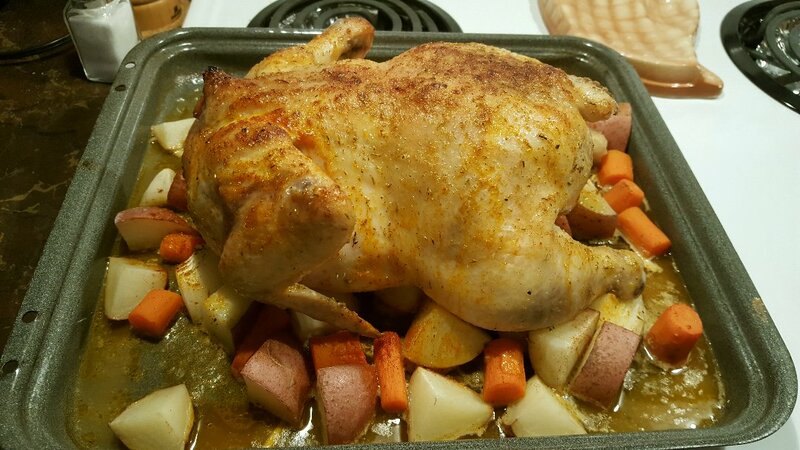 Mmmm, there's nothing better than roast chicken and veggies made right in the same pan! Yours looks delicious indeed! Funny, I always brine turkeys, but never chickens! Looks like that is on my menu for this weekend - got to use up last year's chickens, as the 2017 meat chicks arrive this week! I can't wait to see your next menu plan. You are so awesome! Oh i love your sprouts. I am still trying to decide on the perfect set up for sprouting next winter. I dont't just want to sprout for us but also for my kritters. Horses rabbits goats and chickens. Even just for a treat ... i know they will love it. And so will we. From what I read on google I thought that you could probably just enjoy your lemon without letting it ripen any longer. I can't wait to hear what it tasts like. Sending u good thoughts and lits of energy for your shopping trip !!! Mmmmm that chicken looks delicious!! Love one pan meals! Easy prep and easy clean up! I have never brined a whole chicken - must give it a try one day! Just look at the sprouts!!! Nice job! Some sprouts I prefer over others - some are spicy, some are earthy! I like the earthy ones...not the spicy ones though. I am sure you know, but they should be eaten in about 3 days or sooner. I find that once they get past the 3 day mark they tend to get a bit musty, some I have even had mold on me. Into the compost they go!! I cannot wait to hear about your lemon - I am sure its going to be delicious and hopefully lemon-y. I made your Papas Fritas yesterday. Can you say delicious!!! Oh my. This is definitely a weekend prep though - it was a bit of time from prep to table which I knew from reading the recipe. I wonder if you could substitute french fries for the potatoes for a weekday meal? I took 3 chicken breasts with bone in and skin on and poached them. Then when there were good enough to handle I did the potatoes. Good thing I have asbestos hands! Those suckers were hot! I used a combo of the green tomatillo salsa (my preference) and the regular red salsa (my husband's preference) and the combo was really good! The leftovers today for lunch were grand too - I think the flavors had a good time mingling overnight. Those sprouts really turned out nice and grew quickly. What a feast! Hi Mama Pea :)) The sprouts make me feel so much pride :) And they taste good! I'd like to try sprouting the sunflower seeds next. It's so easy to do and they are really nutritious. I think I can only manage 2 meals with the chickens we have, they are just so tiny these days! 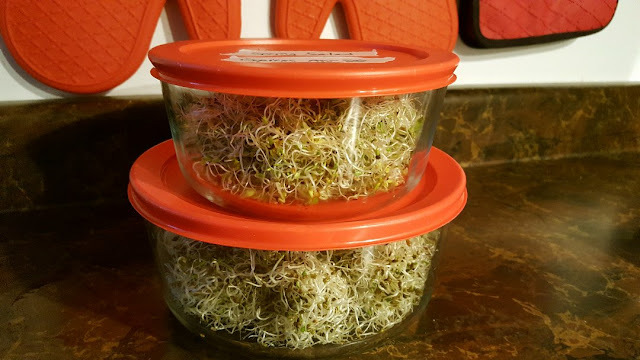 Hi Nik :)) The sprouting is so easy, but if you're doing it for the critters too, you'll needs Mason jars and space. Plus you have to rinse them twice a day so it's worth being near a sink. I think it's totally worth the minimal effort involved. Yeah, I want to try the sunflower sprouts too. I think tomorrow will be "try the lemon" day! I should make a video to keep the memory lol! Hi Dianna :)) Well, I have YOU to thank because you suggested Mumm's! :) They did turn out really well. I saw a video on Mumm's site, they said the sprouts will keep up to 2 weeks in the fridge? It's been a few days, I'll have to test that out. I got them pretty dry so here's hoping they'll last a wee bit longer. Though the alfalfa is nearly gone now! I think the whole monthly shopping planning is all about time. Really. You need to have a relaxed mind to do this because otherwise it gets too overwhelming. Plus in my case, it has to be things on sale, I'll NEVER buy regular priced meats ever. We eat a lot of chicken, so during the month, if I see it at a good price at the local grocer, I'll buy a big amount of it for the freezer. I noticed the best price for boneless skinless breasts used to be $3.99 a pound, lately I've been seeing $4.99 a pound. What an increase. Hi Gill! :) The sprouts really did surprise me, especially the alfalfa ones...one $6 bag of seeds will likely last me months. I have never really tried to do sprouts before. I should add it to the list. That chicken looks delish! My favorite way to have chicken...I think. So cool about your lemon and your lemon tree! I can't wait to hear if you agree with the person that got back to you. What kind of lemon tree is it? I want one...or several! I go through a lot of lemons. Hi Sam :) Believe it or not I've completely forgotten about my little lemon...we have to make something with it tonight. We want to try it as is, or make a wee little lemonade shot with its juice, I'll let you know! The tree is a Meyer lemon tree.